A common practice in meteorological drought monitoring is to transform the observed precipitation amounts to the standardised precipitation index (SPI). Though the gamma distribution is usually employed for this purpose, some other distribution may be used, particularly in regions where zero precipitation amounts are recorded frequently. In this study, two distributions are considered alongside with the gamma distribution: the compound Poisson exponential distribution (CPE) and the square root normal distribution (SRN). They are fitted to monthly precipitation amounts measured at 24 stations in Croatia in the 55-year-long period (1961–2015). At five stations, long-term series (1901–2015) are available and they have been used for a more detailed investigation. The accommodation of the theoretical distributions to empirical ones is tested by comparison of the corresponding empirical and theoretical ratios of the skewness and the coefficient of variation. 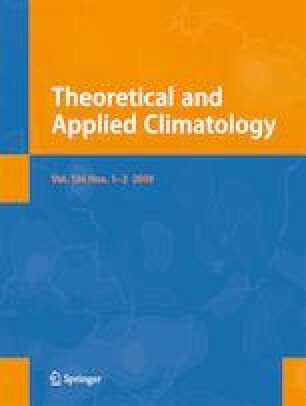 Furthermore, following the common approach to precipitation monitoring (CLIMAT reports), the comparison of the empirical and theoretical quintiles in the two periods (1961–1990 and 1991–2015) is examined. The results from the present study reveal that it would be more appropriate to implement theoretical distributions in such climate reports, since they provide better evaluation for monitoring purposes than the current empirical distribution. Nevertheless, deciding on an optimal theoretical distribution for different climate regimes and for different time periods is not easy to accomplish. With regard to Croatian stations (covering different climate regimes), the CPE or SRN distribution could also be the right choice in the climatological practice, in addition to the gamma distribution. Two anonymous referees are gratefully acknowledged for their constructive suggestions and comments. This paper has been supported in part by the Croatian Science Foundation under the 2831 (CARE) project and it is a contribution to the Hymex programme.